A confluence of events collided on Friday, capping one of the most eventful weeks in years for news affecting your wealth. The most sweeping revision to the U.S. Tax Code in three decades lurched toward passage, requiring urgent attention to tax opportunities open only until December 31. 2017. Meanwhile, a dark new cloud gathered over Washington D.C. following a guilty plea by the former head of the National Security Agency, Michael T. Flynn for lying to the FBI about his contacts with Russia. 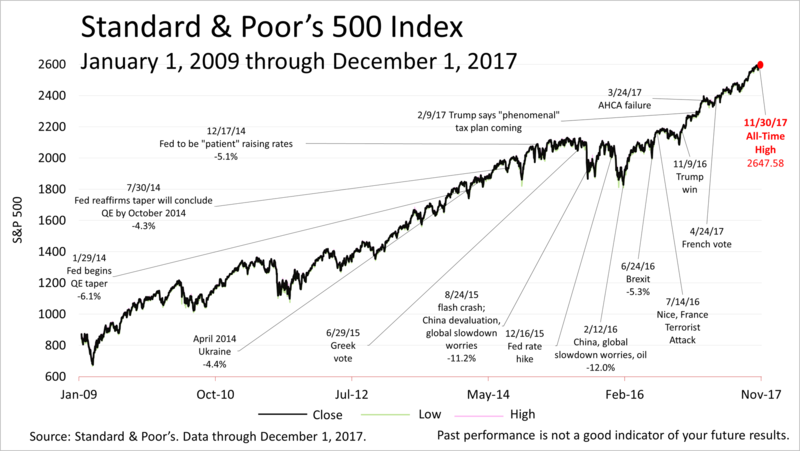 Though the stock market dropped nearly 1% briefly on Friday, the Standard & Poor's 500 index closed the week just a fraction off its all-time high reached on Thursday, as just-released data showed the economy was stronger in November than it has been in many years. 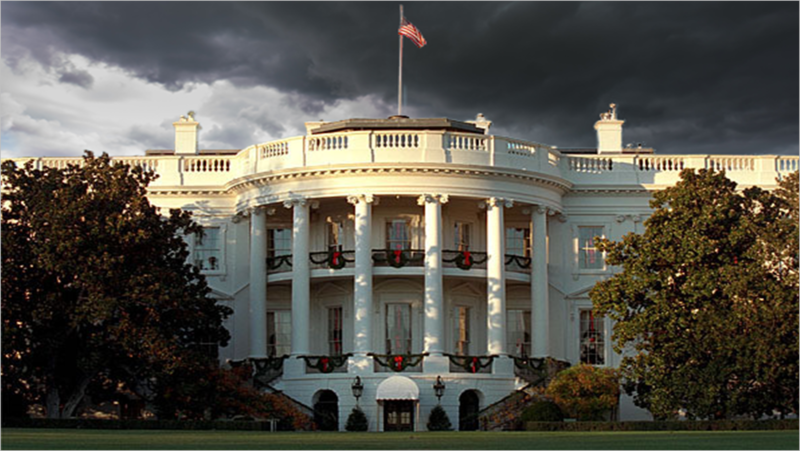 The revision of the U.S. Code is unlikely to be finalized and enacted into law until mid-December or later. But it's unwise to wait for the bill to be in its final form to take action. Too much tax savings are at stake to leave it all to the last minute. Here's a Top 10 list of tips and tactics. 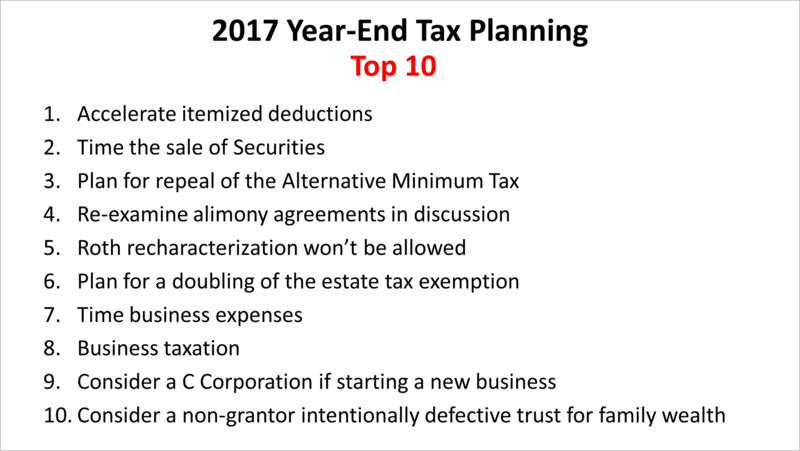 If you are affected by any of these 10 tax situations, please call us and discuss it. Major parts of the legislation could still be substantially changed. With so little time before the year ends to act on these sweeping reforms, please check for tax alerts we will be delivering in email newsletters and on our website between now and the end of the year. On Friday morning, after the former NSA director pled guilty and his agreement to cooperate with Special Prosecutor Robert Mueller was announced, the stock market initially fell sharply. The talking heads on TV immediately sounded breathless and share prices dropped about 1%. But the S&P 500 index of America's largest publicly-held companies rebounded and shares closed just fraction off their all-time high price reached just the day before. 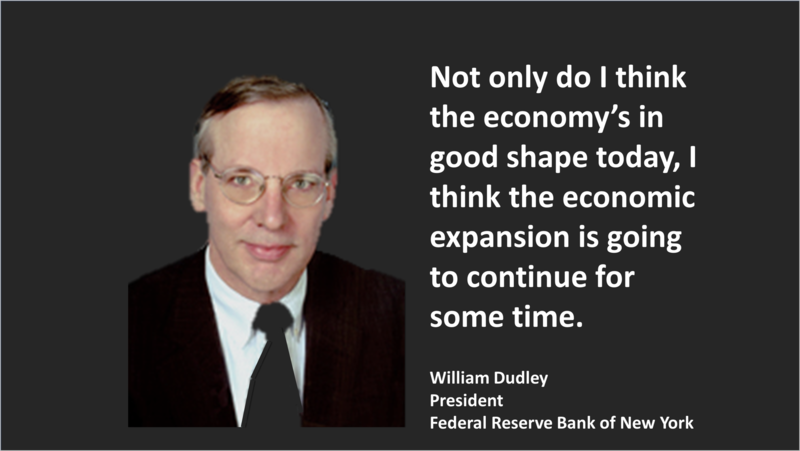 On Friday's front page of The Wall Street Journal, William Dudley, president of the Federal Reserve Bank of New York said in a lengthy interview that the economy is doing "quite well." "Not only do I think the economy's in good shape today," Mr. Dudley told The Journal, "I think the economic expansion is going to continue for some time." 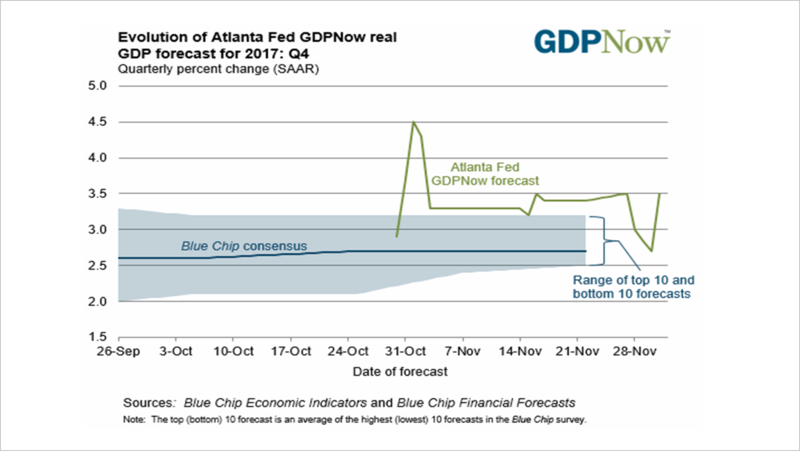 Also on Friday, the Federal Reserve Bank of Atlanta forecasted a real GDP growth rate in the fourth quarter of 2017 of 3.5%, up from 2.7% on November 30. That's a substantial uptick over what had been expected in just the last few weeks and suggests strong growth is under away. In addition, this past week after-inflation figures on real disposable income by the Bureau of Labor Statistics through October were released. 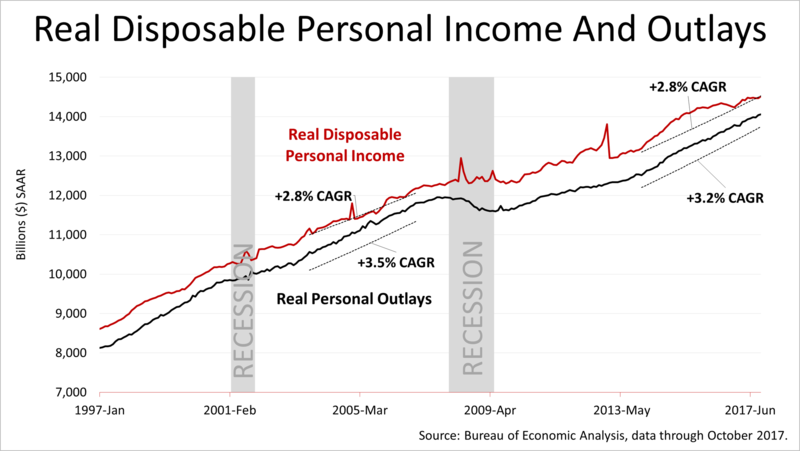 After-inflation disposable income is an important figure in the U.S. economy because it indicates how much money Americans have in their pockets to spend and 70% of U.S. economic activity comes from consumer spending. The latest figures show real DPI has grown at a 2.8% compound annual growth rate, which is as strong as it was at the peak of the last economic expansion - and that was financed on bad debts, while this expansion is occurring at a time when Americans have rarely been better able to meet their monthly expenses. 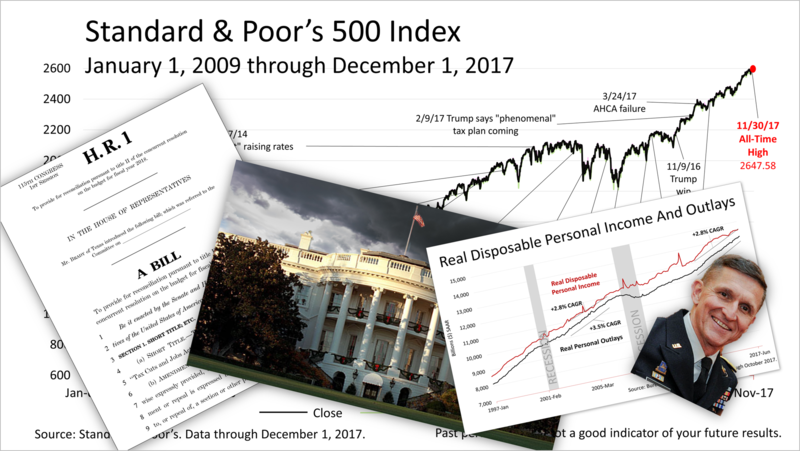 Despite uncertainty over tax reform and the major political scandal enveloping Washington, D.C., the Standard & Poor's 500 stock index, a key growth component in diversified portfolios, closed Friday at 2642.22, just shy of its record close of 2647.58 set on Thursday. The average share price of a stock in the S&P 500 trades at 19.9 times its trailing 12-month earnings and 17.4 times the consensus forecast of Wall Street analysts for 2018 earnings, which is a bit expensive but within stocks' historical valuation range. A 10% or 15% drop could occur at any time on bad news or a change in investor sentiment, and the chance of a bear market decline of 20% or more increases as the eight-and-a-half-year bull market grows older. However, leading indicators point to solid economic growth, disposable personal income has been growing at a good pace, inflation remains dormant and the forecast for the next five quarters is for 2.5% quarterly GDP growth, which is strong. This bull market could continue. This article was written by a professional financial journalist for Sterling Futures and is not intended as legal or investment advice. HSA Or FSA: Which Is Better For Medical Savings? © 2019 Sterling Futures. All Rights Reserved.